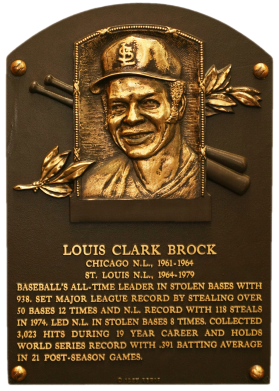 Brock's career totals of 938 stolen bases and 3,023 career hits, coupled with a .293 batting average, gained him admittance to the Hall. In 1974, at age 35, he stole 118 bases. 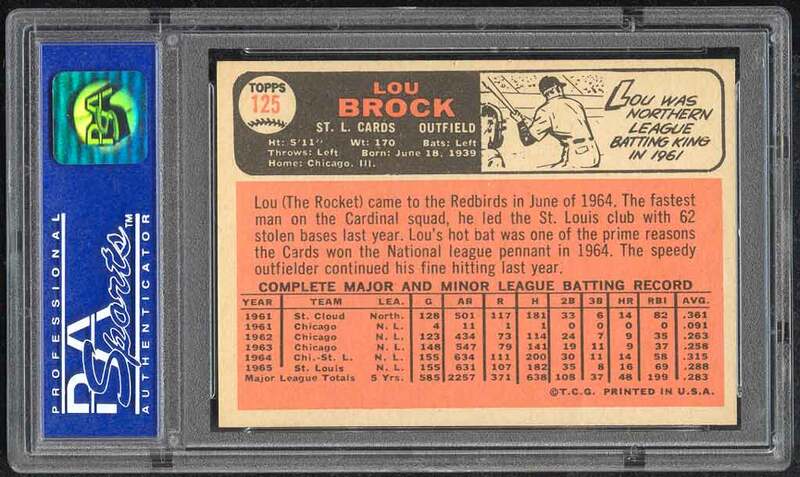 He excelled in three World Series for the Cardinals, hitting .391 and scoring 16 runs. 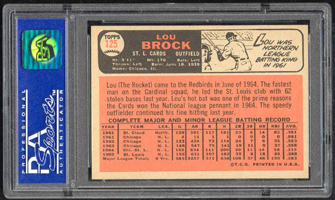 Brock had more than 200 hits four times. Comments: I picked up a beautiful high-end '62 Topps Rookie in 1999, slabbed NM-MT by PSA. It was mint all the way and deserved a MINT 9 rating, beautiful card. But, I also had a '62 Topps Gaylord Perry PSA 8 card. 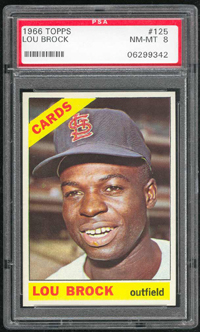 I really liked Brock in the 1966 Topps issue and decided to sell the rookie for a profit and replace it with this example sometime soon thereafter. Just like the '62 rookie, this one is also oh-so-close to a MINT card and really deserves a higher grade. It's in pack fresh condition with razor corners and perfect centering. A beautiful card.